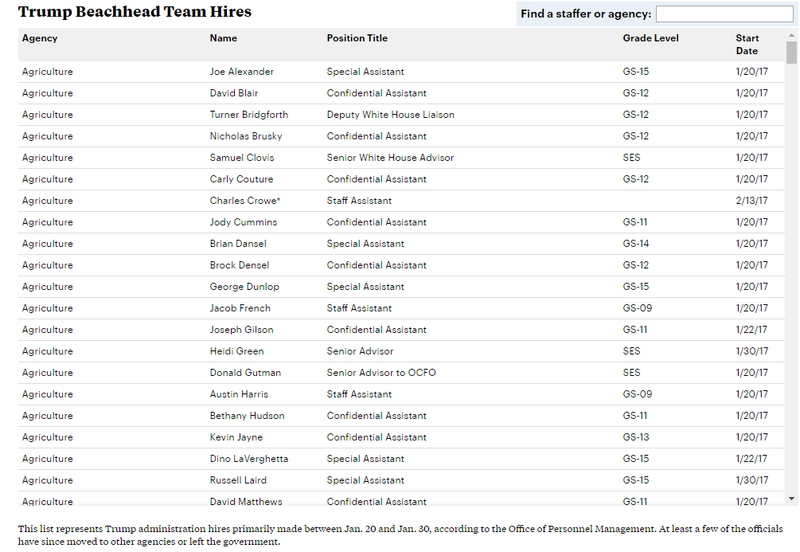 A searchable list of the hires by agency can be found here. 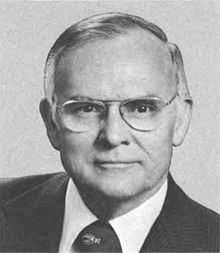 Nate Jones has more on Moss, as well as a review of the biography “People’s Warrior: John Moss and the Fight for Freedom of Information and Consumers Rights” by Michael R. Lemov, here. The content of Leopold’s FOIA is likely relevant – his initial request sought three-years’ worth of NSA Inspector General reports and the NSA’s semi-annual reports to Congress. Before going to court the agency said it had a whopping 22,218 pages of documents covering the last three years alone (154 IG investigations and 137 reports, with about 500 pages of semi-annual reports). Leopold has a Twitter thread on the suit that anyone interested in this obfuscation should read in its entirety. Justice Department trial attorney Alice Shih Lacour defended the Environmental Protection Agency’s decision not to consider an appeal timely – even though it was in the agency’s possession within the appeal timeline – in court on the grounds that, while the agency had received the appeal through FOIAonline in time, it had not been logged into the agency’s system by a staff member until after the appeal deadline. Harry Hammitt of Access Reports notes that in Competitive Enterprise Institute v. United States Environmental Protection Agency, Civil Action No. 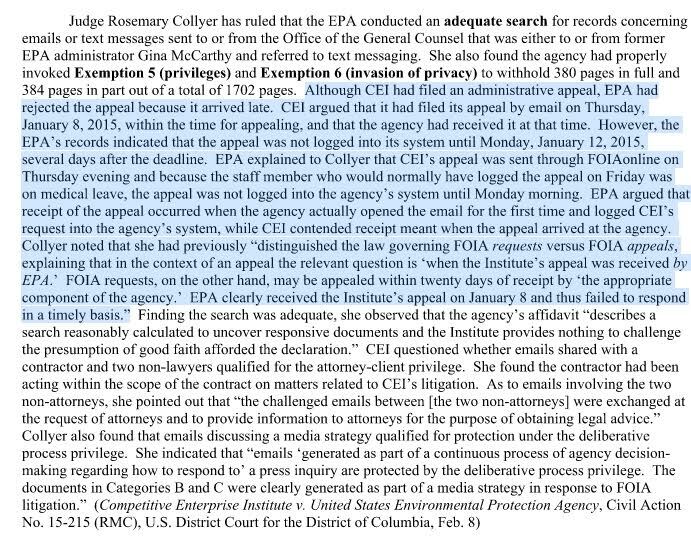 15-215 (RMC), U.S. District Court judge for the DC Circuit Rosemary Collyer – while upholding the adequacy of the agency’s search – found that the agency “clearly received the Institute’s appeal” on the day it was submitted – not logged into the system – and failed to respond in a timely basis. If the DOJ stopped upholding bad agency FOIA practice, requesters wouldn’t be forced to sue for the documents they are entitled and agencies would feel more pressure to follow the law. For more on the challenges PCLOB has faced over the years, go here, here, and here. Two California lawmakers – Senate President Pro Tem Kevin De Leon and Assembly Speaker Anthony Rendon – filed a FOIA request with Immigration and Customs Enforcement for more information on immigration activities. The lawmakers specifically sought information on “the federal government’s policy when it comes to ‘sensitive’ areas such as churches, schools and hospitals.” Last month federal officials detained hundreds of people after Trump pledged a “crackdown” on illegal immigration. A FOIA request to the Army shows that national security advisor H.R. McMaster was rebuked in 2015 for his handling of a sexual assault case involving two junior officers. According to an Army Inspector General report, “McMaster violated Army regulations by permitting the two lieutenants to attend the service’s elite Ranger School even though they were under criminal investigation.” McMaster chose to allow the officers to attend Ranger School while under investigation contrary to Army regulations because, he told investigators, he “did not want to interfere with the two lieutenants’ military training.” A special waiver from the Army’s deputy chief of staff at the Pentagon would also have allowed the lieutenants’ attendance; McMaster informed investigators he was unaware of the waiver requirement. Gen. Daniel Allyn, the Army’s vice chief of staff, told McMaster in a “memorandum of concern” obtained through FOIA, “I am disappointed with your actions. As a senior leader in the United States Army, you are expected and required to understand and comply with all laws and regulations.” The memo does not appear in McMaster’s personal file. Have you reserved your space for the U.S. National Archives Sunshine Week event on Monday March 13? On Monday the National Security Archive’s director Tom Blanton will join Ralph Nader, Dean of the University of Maryland’s College of Journalism Lucy Dalglish, and Tom Susman of the American Bar Association at the U.S. National Archives for a panel on FOIA After 50. Space is limited for the event, which will be held in NARA’s McGowan theater, so please register here by Friday, March 10. The National Security Archive, whose Indonesia/East Timor documentation project that has sought to identify and seek release of thousands of secret U.S. documents concerning U.S. policy toward Indonesia and East Timor from 1965-1999, is happy to see the “indexing on demand” at the NDC produce such good results, and looks forward to more researcher-driven declassification. How did the FBI Discuss Russia’s Cyber Intrusions in the Late 90s? 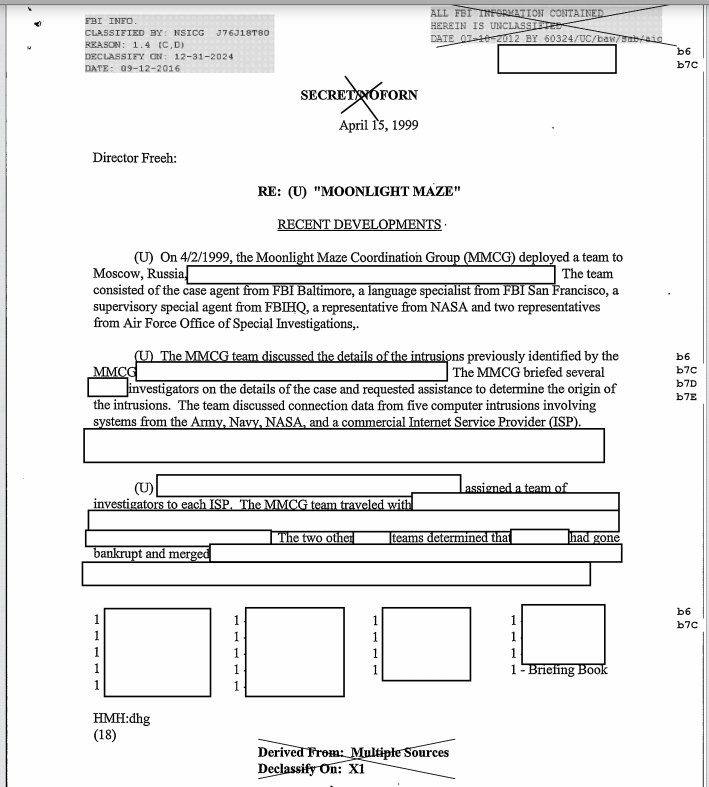 A new FOIA release from the FBI to the National Security Archive reveals more information on “Moonlight Maze,” the investigation into sophisticated cyber attacks on the Pentagon’s computer system – as well as computer systems for NASA, the Energy Department, and prestigious private institutions – in the late 1990s that were traced back to Moscow. The Secret FBI memo is a less-redacted (though still quite redacted) version of a memo released in 2012, and contains new information on the bureau’s discussion of possible responses to the computer intrusions. According to the document, “the attendees also agreed that the NIPC should coordinate the development of a passive ‘honeypot(s)’ at Army and/or Navy victim sites that may assist in providing information about the intruder.” The group also discussed the feasibility of creating a second passive “honeypot(s)” containing a “beacon” file, which would plant a source code in a file that would feed information back to investigators once opened. This document is one of 10 new additions posted in the National Security Archive’s Cyber Vault on Wednesday, March 8. This week’s #tbt pick is a 2005 posting on “Saddam’s Iron Grip” – featuring a series of declassified U.S. intelligence documents and other U.S. agency reports on Saddam Hussein’s human rights abuses. The posting contains a number of documents produced by U.S. agencies from 1975 through 2005 concerning the Iraqi regime’s policies and activities directed at maintaining itself in power and eliminating or neutralizing opposition to the regime.